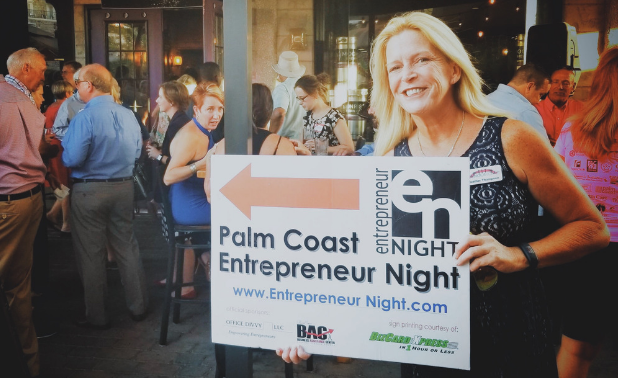 It was an out of this world experience for Entrepreneur Night’s third visit to Moonrise Brewing Company at European Village in Palm Coast, Florida. Absolutely amazing weather set the stage on Tuesday, September 25. Over 150 people gathered for food (#TacoTuesday), peer-to-peer networking and delicious drinks from Moonrise’s microbrewing selection. Vern Shank of Pyramid Disc Jockeys played the music and served as M.C. Beach FM and WNZF provided valuable advertising as sponsors. Office Divvy staffed the hospitality table. Perhaps most exciting, September’s Entrepreneur Night was punctuated by a tremendous group of first-time attendees. That group included Wynn Newingham, the newly-installed Head of Innovation & Economic Growth for the City of Palm Coast. Raymond Peter of Palm Coast Business Assistance Center and David Ferguson of the local SCORE chapter also took to the microphone to provide insight on how far the entrepreneurial landscape has come in Palm Coast over the last 7 years. Both organizations serve as event partners. Finally, the night concluded at The Humidor Cigar Bar and Lounge—just steps away—for the official Entrepreneur Night After Party.